Omaha Public Schools is piloting a new online service from Microsoft for teachers who use the education edition of Office 365 Education. Microsoft Classroom, currently in preview mode, offers course management features through a homepage where educators can post announcements, assignments with due dates, calendar events and reminders. The intent of Classroom is to enable the teacher to organize multiple class sections, create and grade assignments, collaborate with other teachers in professional learning communities and give feedback to their students. Office 365 Education is Microsoft's free and premium cloud-based productivity suite for schools. "Classroom" is the same name Google gave to its own suite of free productivity tools for classroom use. That software works with Google Apps for Education. 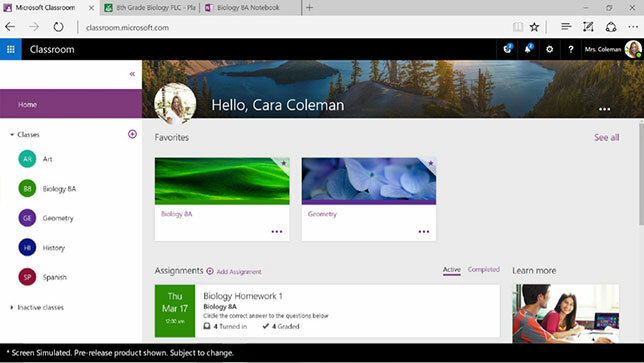 The Microsoft version of Classroom works alongside its OneNote Class Notebooks, included in Office 365 Education, to provide a personal workspace for each student as well as a content library for handouts and a collaboration space. Notebooks, which have been available since 2014, integrate with popular learning management systems via IMS' Learning Tools Interoperability. Students enrolled in the LMS course can access the notebook for that class automatically. At the same time the company announced Microsoft School Data Sync (SDS) and Microsoft Forms. SDS works with Classroom to sync user profiles and class rosters from the district's student information system in order to populate Classroom groups and websites. The functionality of SDS will be slip-streamed into Office 365 Education. Forms provides a way for teachers to create surveys and quizzes to get feedback from students and do quick assessments of student progress. Teachers can try out a preview version of Forms by registering on this Microsoft site. Rob Dickson, executive director for information management services at Omaha's district, said the use of SDS and Classroom "simplifies our digital classroom management and frees up our teachers so they can spend more time with students and less time managing administrative access to class materials." Teacher Chrystal Rico noted that when students head home, "They can log in. They don't have to worry about, 'I forgot this book at school'; 'I forgot these notes I need to study for my test.' It'll all be there." Kelly Arbuckle, a librarian and a Microsoft "innovative educator expert," said she no longer has to worry about copies or if a student has been absent. "I can load [the content]. They can access it. [Students] who are more advanced can go off and work on their own. The ones who are struggling a little bit, I can give them the support they need. And everyone can feel successful."